As a passionate lover of Elena Ferrante’s novels, I am sorry to report that I am not in love with Frantumaglia: A Writer's Journey, a collection of Ferrante’s letters, essays, interviews, and material deleted from her early novels. A shapeless repetitive compilation, Frantumaglia is more like a scrapbook than a book. The intriguing title which Ferrante defines as her mother's word for “a disquiet not otherwise definable... a miscellaneous crowd of things in her head, debris in a muddy water of the brain” does not bear much relationship to the book which is mostly a series of explanations, rationales for Ferrante’s work. I might have had a somewhat more positive reaction if I had read Frantumaglia before Claudio Gatti’s well-documented claim that Ferrante was Anita Raja, who, unlike Ferrante, did not grow up in an impoverished Neapolitan neighborhood but rather left Naples at the age of three and lived in middle class comfort in Rome. Presumably, Raja had ready access to the educational opportunities that Ferrante’s characters struggled to obtain. Throughout Frantumaglia there are numerous references to Ferrante growing up in Naples—including references to childhood fears of growing up in a violent neighborhood and her relationship with her mother, who spoke the Neapolitan dialect and worked as a dressmaker. Ferrante described Naples as “a space containing all my primary childhood, adolescent, and early adult experiences.” Ferrante’s publishers apparently encouraged this. One of the first letters includes a reference to Sandra Ferri’s request that Ferrante contribute to a book she was editing about growing up in Naples. From what I have read in many reviews and blog posts, most of Ferrante’s devoted readers are not bothered by this deception and tend to view the falsely claimed Neapolitan background of Ferrante/Raja as a literary device. However at the same time, they tend to see the wide-ranging reflections in Frantumaglia as the genuine beliefs of the author, presumably Anita Raja. But if some sections of Frantumaglia are fiction, how can we be sure the rest is not? I have been struck by Ferrante’s understanding of the way both her male and female characters are prisoners of gender, their lives constrained by the expectations of a deeply sexist society. However, I dismissed the rumors that her books could have been written by a man or in collaboration with a man. There were just too many intimate details of life in a female body. When Claudio Gatti wrote his article claiming to have proven that Ferrante was Anita Raja, he also left open the possibility of collaboration with her husband Domenico Starnone. Interestingly, most of Ferrante’s devoted readers have ignored this claim and focused on what they saw as Gatti’s unmasking of her, frequently describing it in terms of sexual violation. Almost without exception they directed their outrage at the unmasking and seemed ready to accept the misrepresentation of Ferrante/Raja’s class background as a fictional device. 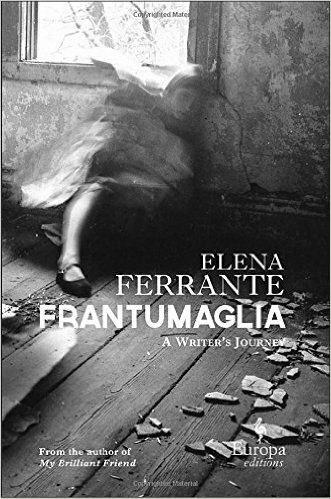 However, given all the protestations that only a woman could have written such an authentic account of female experience, I don’t think most of Ferrante’s readers would be as willing to accept the possibility that the books were written in collaboration with Starnone, or that Starnone might have been the principal author. I was one of those once passionately claimed that Ferrante’s books had to be written by a woman. Now I am not so sure. After analyzing Ferrante’s books with text analysis software, a group of physicists and mathematicians at La Sapienza University in Rome concluded that there was a “high probability” that Starnone was the principal author. Also, the powerfully rendered portrait of growing up in deep poverty in 1950’s Naples feels like it was written from first hand experience. Raja did not have this direct experience but Starnone, like the fictional Ferrante, was the son of a seamstress and did spend his childhood in Naples, thus lending further support to the contention that Starnone was Raja’s collaborator. The controversies about the authorship of Ferrante’s novels has left me questioning many of my assumptions about literature—including the idea that great literature must be the work of one mind, one visionary genius. Recent Shakespeare scholarship suggests that a work of genius can be a collaborative effort. Using computerized tools to analyze texts, the New Oxford Shakespeare ’s team of international scholars have concluded that Henry VI, Parts One, Two and Three are among as many as 17 plays that they now believe contain writing by other people. In some sense all works of art are collaborative and Ferrante in Frantumaglia makes this point: “And yet there is no work that is not the result of tradition, of many skills of a sort of collective intelligence.” References to joint authorship exist within the books themselves. In the Neapolitan Quartet Lila and Elena dream of writing a novel together and Elena credits Lila as the inspiration for much of her writing. What Elena refers to as the “joys of shared creation” is a major theme throughout the Neapolitan quartet. I was struck in reading Frantumaglia that much of the writing was very different from that that of the novels—much more abstract, more academic. Michiko Kakutani has noted that Ferrante’s “self-conscious and stilted statements [in Frantumaglia] stand in stark contrast to the visceral immediacy of Ms. Ferrante’s novels.” Of course, changes in style do not necessarily mean two authors. I don’t expect we will ever know the extent to which Starnone had a hand in this; the publishers certainly have a stake in the image of Ferrante as a powerful woman writer. Although there would certainly be many Ferrante fans who would be deeply disappointed to learn that the books were not solely the work of a woman, there would probably be others intrigued by the collaboration of a man and woman on books that so powerfully explore issues of gender. But in the last analysis what does it matter? The books are truly wonderful whoever wrote them. Although I sympathise with you finding the book a bit repetitive, I found Frantumaglia fascinating, especially as I'm doing a Phd on her three earlier novellas. There are plenty of insights and nuggets in here which are helping me so much with my research. I agree, it's fractured and less compelling than her fiction, but really does go deep into her thinking about gender, control and her female heroines.